This is actually a mix of two different ice creams and some mix in’s. By doing it this way you get ribbons of flavor and while it’s a bit more work it is worth every second of it. I will say if you will want to have an ice cream machine that came with 2 freezer bowls, or buy a second bowl. While the ice cream machine is in the last few mins of the marshmallow frosting add some mini chocolate chips to mix in. Then fill about half your container with the ice cream (then put it in the freezer while you run the chocolate through the machine). I used two bread pans for this, but of course tupperware works great too. While my chocolate ice cream was in the last 10 mins of mixing in the machine I started making my Marshmallow frosting so that it was finished at the same time as the ice cream. 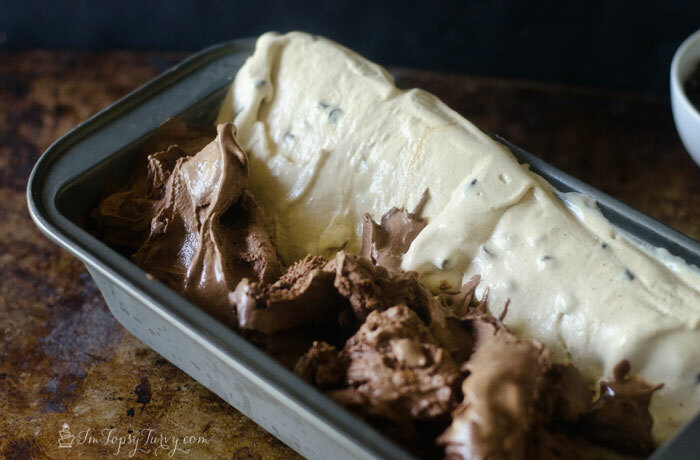 Plop some of the creme between the two ice creams, you won’t necessarily use the whole amount, go with your gut. 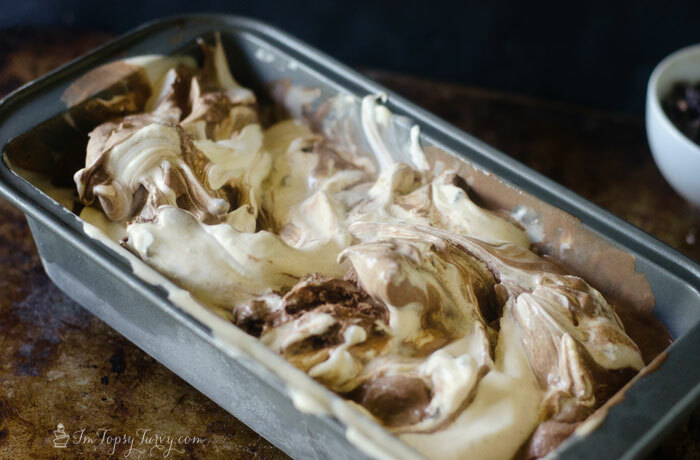 Now using a frosting spatula (or another spatula, just not a spoon) swirl the three ingredients together. Do NOT over mix, you want there to be three distinct ribbons of flavor in the final result. Once your happy with how it’s mixed up then go ahead and shake your pan/container so it flattens a bit! Now top it with more mini chocolate chips and the golden grahams and place in the freezer to set! The golden grahams are ONLY part I’m not happy with, it LOOKS great, but the cereal ended up softer than I wanted it after it froze. But regular graham crackers get soggy too, and so does a graham cracker crumble. So I’d LOVE some tips on a graham option that would stay CRUNCHY I’d LOVE to hear it! For now I’ll leave them off the ice cream and just top the ice cream when serving. After it’s frozen overnight (or 4-6 hours) serve!!! 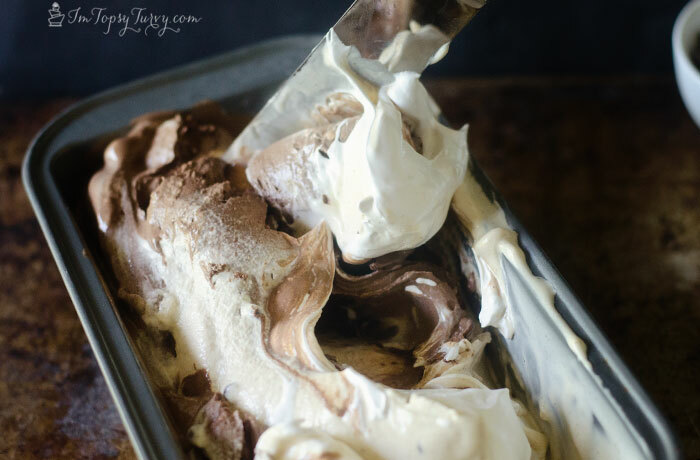 I LOVED scooping into this ice cream and seeing the sections of the chocolate and marshmallow ice creams and the large sections of marshmallow creme (this “frosting” is amazing and stays soft even when frozen, I seriously eat this on everything from cake to ice cream to serving with my hot chocolate) It’s just so pretty! 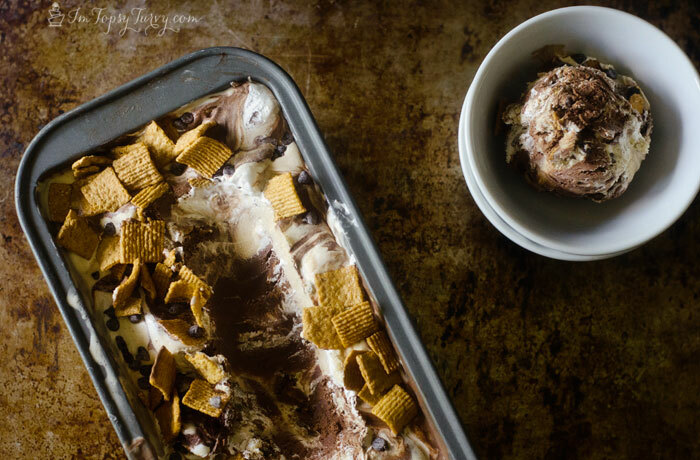 I really need to buy a second ice cram maker, and this here ice cream knocked it out of the park! totally, my mom bought me the set with two, I can’t imagine only having one bowl, it makes a huge difference! This looks wonderful. Delicious. You sold me with the cereal, a personal favorite. I think I might crush it and roll the top of the cone in the cereal, that way it is eaten first and less of a chance to get soft. I love the cereal on top, it’s my favorite cereal anyway, so next time I just will leave it off and top it as I eat it to keep it crunchy! 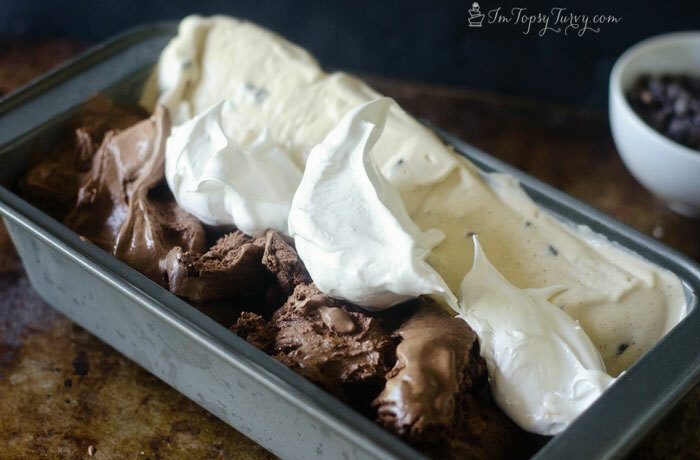 This looks like one DE-licious ice cream, love each yummy layer! I just finished off the first container and moved on to the second, I’m obsessed! 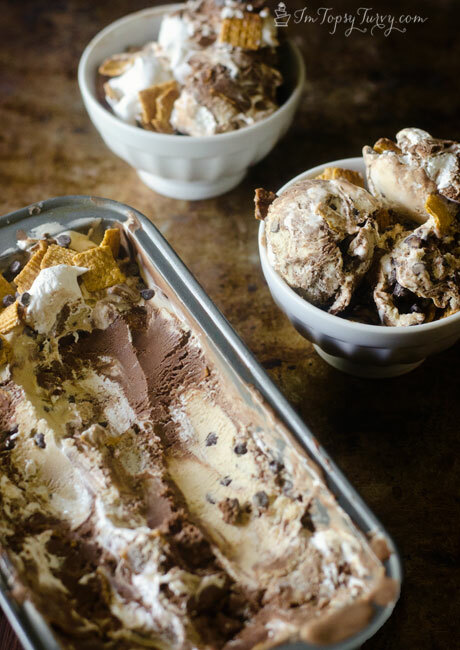 Ice cream is it’s own food group in our house, and this s’more ice cream is stellar. Really, really fantastic. I’m going to HAVE to make it for my family, assuming I’m willing to share. Cake is our first food group (grains), ice cream is our second (dairy), chocolate is third… And do what I do, make two containers, hide one for you, share the other! I’d like a big bowl of that! I do love s’mores. 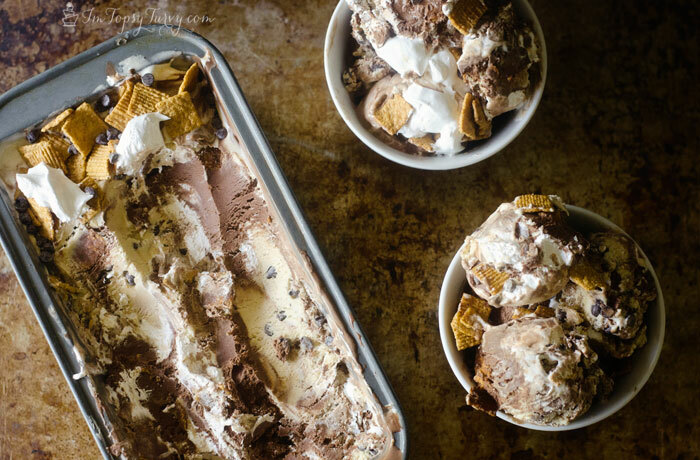 S’mores are good, but this ice cream is impressive! 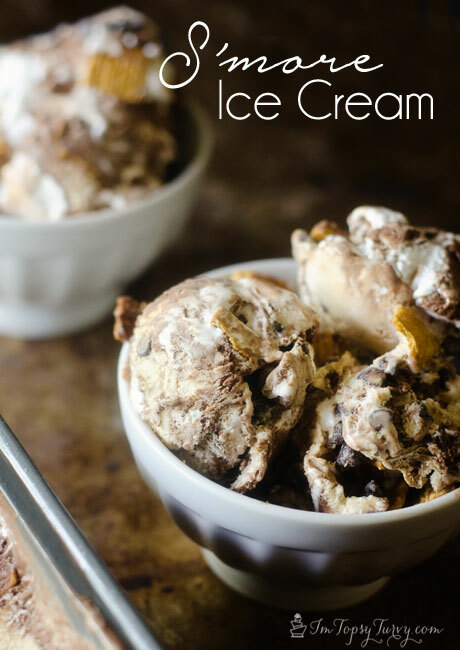 My favorite way to have real ice cream is full of ribbons, chunks and treasures. I love this. Agreed!!! I’m a big ben and jerry’s fan with all their ribbons and chunks so this is right up there. I’d take this marshmallowy goodness as a “core” any day of the week! As if this wasn’t already labor intensive, BUT you could roll the grahams in some chocolate first so that they would stay crunchy. This looks so amazing. hmmm good idea! I’ve been thinking about mixing some butter, pressing it and cooking it (like a crust) to see if that would crumble well. Still working on it, I’ll figure something out! I can’t wait to try this ice cream! It looks super scrumptious! I have a suggestion to help with your Golden Graham dilemma. 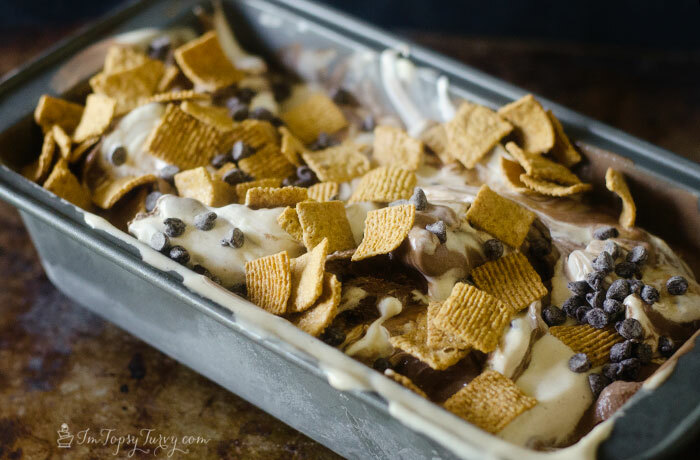 I once saw another soft-food recipe that used mini teddy grahams. I hope this helps. Thanks for this wonderful recipe! it is seriously SO divine! I keep making it over and over again! Seriously so good! I’m going to make another batch this week! It’s a little messy but oh so worth it! I truly have no words aboutt his epic creation of creamy deliciousness! If you “candy” your mix in with some brown sugar in a dry sautee pan it’ll stay crunchy! I always candy or caramelize my golden grahams before I layer them into my ice cream. Another trick is to freeze or refridgerate any mix ins that you’ll be using. Coating mix ins with chocolate can help as well.